One of the things I enjoy so much about SL is the freedom to change your avatar. There is so much fluidity to the human sliders on the basic avatar, and then there are the creative artists that make prim attachments and costumes and hair and shapes and skins so that we can appear to be almost anything, any size, any era, any gender, ad infinitum. Some of the tools in SL are so easy to use that basic costumes are a snap. And then you have the creative geniuses at places like Grendel's Children or DarkDharma or Psyra Extraordinaire and Seven's Selections and many many other content creators in SL! Here's a few of my favorite recent playthings! Tiny fairy avatar by Seven's Selections in Flotsam Beach - compare to the lovely and talented Whitney for tiny size comparison! 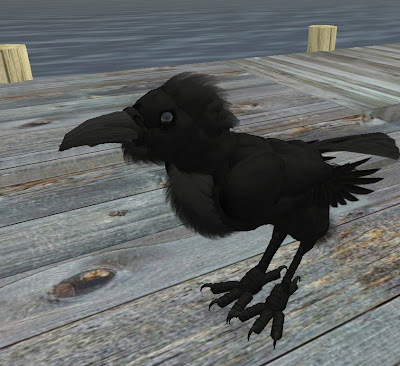 An amazing Raven avatar by the talented Psyra Extraordinaire, who now has a Birdworx section all her own at Grendel's Children. Fantastic dragons abound at Grendel's Children, this one comes with a riding attachment, that is sold separately. Trainable dragons! Who knew?